"When I made this dish, I left the kitchen window open," writes the anonymous Lisa, who posted this dish on the allrecipe website. "The smell attracted several male neighbors, and when my husband came in, he said that it smelled so good, he hoped it was coming from our house and not from someone else's! Serve with my Moroccan Couscous and Cucumber Raita on this site." That sounded good to us. Not so much the men coming running bit, since Julia is happily married to an eminent Ancient Near Eastern scholar, and I'm still stupid for the flamenco guitarist. But anything that smells good enough to bring men running must by definition have something extra; some mysterious something contained within the 14 spices (plus lemon zest!) that touches the primal animal. It sounded promising indeed. So we printed it out and ventured into my spice box to see what I had on hand. It was when we saw how much space the spice and jar bottles took up on my table that we gave the recipe its new working name of Lamb with a Thousand Spices. Brown half the lamb in 1 tablespoon of olive oil in a large, heavy-bottomed pan (we used the tagine). Remove to a plate and repeat with the remaining lamb. Add onions and carrots to the pot and cook for five minutes. Stir in the fresh garlic and ginger; continue cooking for five more minutes. Return the lamb to the pot and stir in the lemon zest, chicken broth, tomato paste and honey. Bring to a boil then reduce heat to low. Cover, and simmer for 1 1/2 hour to two hours (we did two and a half). You can thicken the broth if it's too thin. Working the night before, Julia spooned out the spices into a gallon Ziploc bag. We doubled the amount because we'd almost doubled the amount of lamb to feed the Seder guests. This is before I remembered that two of the wives in attendance are strict vegetarians and wouldn't be touching the stuff. No matter, I thought. If this dish came out as promised, the men would eat more than their fair share. 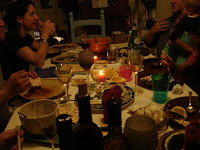 The next day, the day of the Seder itself, we started cooking at about 1 in the afternoon. I chopped and diced, trying hard to stay focused in the face of my growing panic that we'd started too late and that none of this was going to turn out anyway. Luke arrived to see the kids and Julia. First words out of his mouth: "It smells incredible in here! What are you cooking?" "It smells fantastic in here! What are you cooking?" Third man: Dr. Ash. "Oh my God. What are you cooking?" Fourth man: Tony. "Que Alegria! Is that the lamb?!" Over the course of its simmering, we noted that the lamb had a significant kick at the end. Maybe we'd put in a bit too much cayenne pepper? Julia suggested adding a lot more honey, which we did. I can't tell you exactly how much. Two twirls around the perimeter with the bear. Finally. The Lamb with a Thousand Spices was done. Julia added a fistful of prunes to the mix toward the end, because a lot of traditional lamb tagines include prunes, apparently. And at the table she sprinkled it with freshly-chopped coriander. Next time, I suppose. This dish paired great with the shiraz Tony brought and got raves from everyone who tried it. There were some leftovers, but not a lot: The males came through, each going back two or three times for more. In all, it was a vast improvement over my miserable failure two years ago. But that was a wholly different recipe, and of course, I didn't have a tagine yet, either. Lamb with a Thousand Spices will be made again, and soon. Perhaps for a Spring party?